One of the most popular types of Etruscan jewelry is the fibula, a garment fastener consisting of a straight pin coiled to form a spring at one end, a catchplate that secures the pin at the other end, and a decorative element that holds pin and catchplate together. Fibulae in the shape of leeches (Italian "sanguisuga"), or boats were very common in Etruria during the 7th century BCE. Like this example, they generally have a bow-shaped head and straight foot, derived from Villanovan bow-shaped brooches. 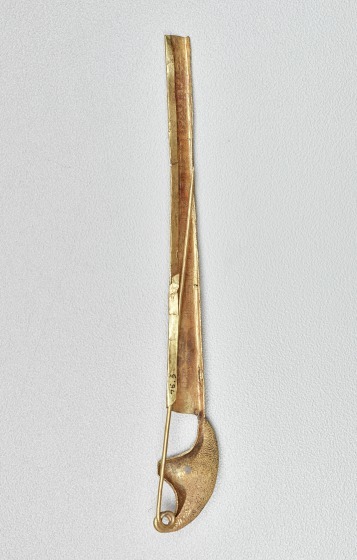 With its extremely small and delicate granulated ornament, this large, boat-shaped fibula is one of the finest in the Dallas Museum of Art's collections. In the granulation technique, minute globules of gold were dropped upon a resin base on the object to be decorated. Once the piece was heated, the resin base evaporated, leaving the granulation pattern fused with the base. This piece is decorated with a guilloche (rope) pattern surrounded by an overall field of granulation. Inscribed in Etruscan lettering on the inside of the rim is mi mula arathia lethana chailus prasnaia. 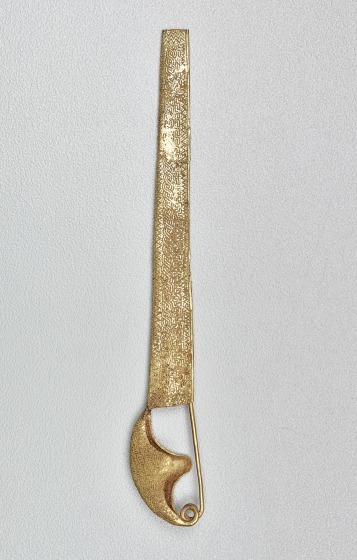 Barbara Deppert-Lippitz, Ancient Gold Jewelry at the Dallas Museum of Art (Dallas: Dallas Museum of Art in association with the University of Washington Press, 1996), 34; 122-23. Anne R. Bromberg, and Karl Kilinski II, Gods, Men, and Heroes: Ancient Art at the Dallas Museum of Art. (Seattle: University of Washington Press, 1996), 110. 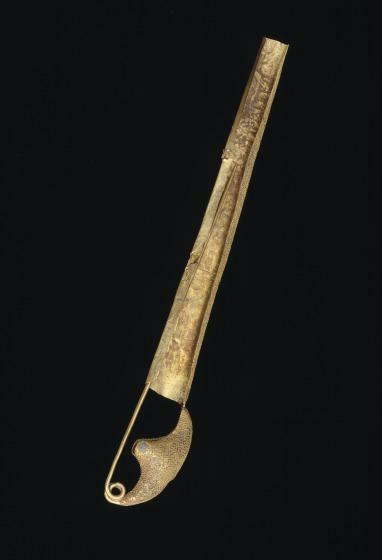 An incised inscription on the back or inside the catchplate of an Etruscan fibula is rare.